As tensions with the US and Russia continue to devolve, the Russian state run media has issued a warning—while mockingly calling out the US—for its citizens to stockpile food and supplies in preparation for war. Moscow, Russia – A Russian state television news segment on Tuesday urged citizens to stockpile non-perishable goods and water as the impending threat of a “catastrophic” conflict with the United States intensified over potential western military strikes against the Syrian government. 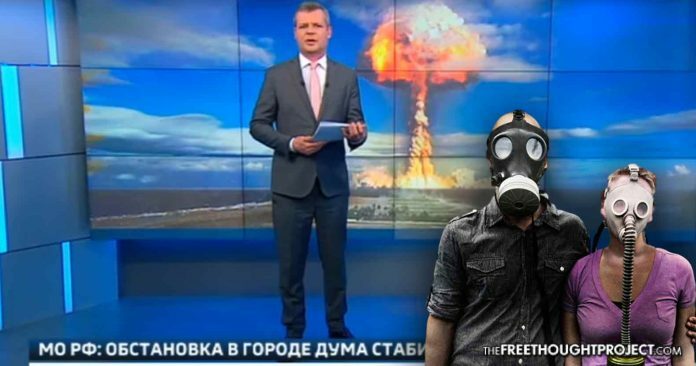 A newscaster for Russia’s Vesti 24 mockingly told viewers, “who succumb to panic and decide to spend all their savings,” to stock their bunkers with basic supplies, such as rice, sugar, salt, oatmeal and other products that maintain a long shelf life, as an image of mushroom cloud from a nuclear explosion was shown on the screen behind him. He went on to explain that at least 30 liters of water would be required for drinking water, food preparation, and personal hygiene. The news anchor then added—in a likely attempt to mock the United States— “It should be noted that real panic isn’t here but across the ocean,” pointing out that sales of bomb shelters in the United States “took off” after Trump’s election. The broadcast was seemingly precipitated by allegations that the Syrian government used chemical weapons in Douma, a claim the Syrian government vehemently denies, and which resulted in the US, UK, France and Saudi Arabia threatening a coordinated military response against the Syrian government. On Friday, Russian foreign minister Sergei Lavrov announced that they have “irrefutable” evidence that a hostile intelligence agency of a foreign government staged the alleged chemical attack. Trump also noted that the US/Russia relationship is now “worse now that it has ever been” and scolded Moscow for aligning themselves with “gas killing animal” Bashar al-Assad. There are reports of a dispute within Trump’s national security team about the scope of the response in Syria, with Trump and newly minted National Security Advisor John Bolton favoring broad strikes, while Defense Secretary James Mattis and Chairman of the Joint Chiefs of Staff Joseph Dunford favor more limited action. There is a clear disconnect between the more aggressive posture of civilian leadership and the more nuanced approach of the Pentagon, as the DoD is wary of potential escalation of the Syrian conflict into a regional, or potentially even global war that has the potential to go nuclear. Reuters reports that the Kremlin announced on Thursday that the US and Russia were actively using a crisis communications link in an effort to avoid an accidental clash over Syria that could spiral out of control.